Source: Universal McCann International Social Media Research Wave 3 The PDF Version is available here. I have a collection of social media snack facts misc. bites I've screen captured from research studies about social media over the past couple of years. They've even been helpful to others in preparing presentations. The most recent find is this slide deck with lots of detailed usage information about global social media usage over the past 2-3 years from Universal McCann International. 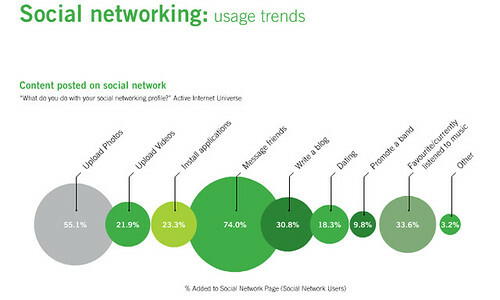 Social networks becoming utilities for peer-to-peer relationships - 74% use them for messaging friends. There's lots of stats about reading and blogs as well as other types of social media. Jeremiah Owyang has more here. LOL at the footnote connection to the article about people faking their age. I always put my real age and think "It's going to be obvious who I am because no one else is this old," and now I see that I am joined by millions of fake elders!